Earlier this week, we found out Guardians Of The Galaxy director James Gunn originally wanted Stan Lee’s standard cameo to involve a pretty hilarious middle finger. The scene would have taken place in the Collector’s Museum, but it was ultimately cut. Those of you with sharp eyes are probably thinking to yourself, "Hey, that doesn’t look quite like Stan Lee!" That’s because it’s not. On the day the proposed cameo was supposed to be shot, Stan Lee wasn’t able to make it over to the United Kingdom. So, it was shot with a look-a-like with the intention of reshooting it with the same lighting later. But that never happened. Initially, reports swirled that Disney wanted no part of the cameo because executives didn’t want to see the beloved Marvel spokesman flipping the bird. If Gunn is to be believed, however, it was actually more of a creative decision thanks to how it played after a key scene earlier in the film. Although I thought the cameo was funny, I thought the flipping off joke was too similar to the moment earlier in the film where Quill flips off the Nova Corps, so I excised that part of it immediately. 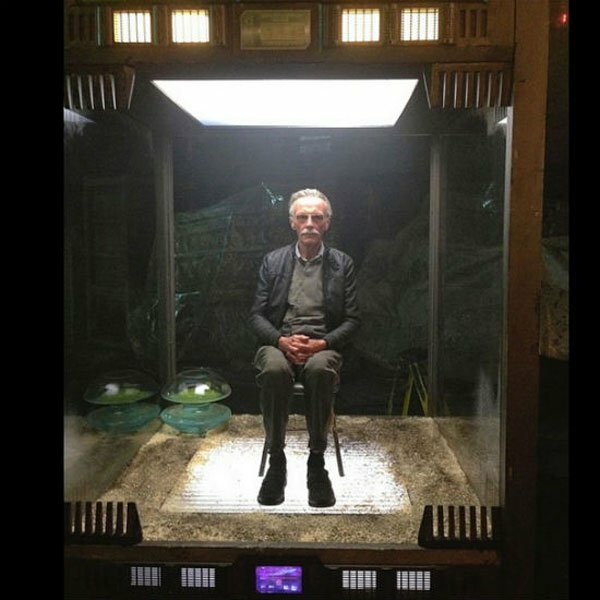 A couple of the guys at Marvel thought Stan Lee in a case was too broad of a joke in general, and that it took the audience out of the movie. I argued about it for a bit, but we ended up not keeping it in the film. Considering Disney was OK with letting Chris Pratt fire up his middle finger earlier in the movie, it makes a little more sense than they would be fine with another middle finger in the movie. Given it wouldn’t have made sense for James Gunn to return to the same joke too, I’m willing to buy this entire explanation. Besides, it’s really not a problem considering he was able to cameo in the hilarious scene where Rocket and Groot were judging every single person they encountered and saying horrible things. Here’s to hoping Stan Lee is able to continue cameoing in Marvel movies for another two decades. Fans love it. He seems to get a kick out of it, and given all he accomplished in the comic book industry, it’s fitting that he would get some more moments in the sun.